Special Containment Procedures: SCP-450 is to be kept locked and secured at all times, except for monthly maintenance and cleaning as detailed below. Any civilians or personnel who enter SCP-450 at any other time are to be considered lost, and no rescue attempts are to be made. 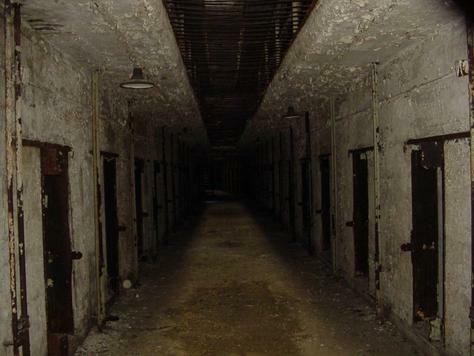 Description: SCP-450 is the death row block of the abandoned ██████████ Federal Penitentiary in █████████, ██. Distance from entrance to the execution chamber is approximately 166.5 meters. A complex pattern, drawn in human blood, is located on the wall behind the electric chair. This pattern slowly degrades over time due to normal environmental decay and must be maintained regularly. Entering the cell block by any means other than the main door. Moving at a speed greater than 0.25 meters per second. Staying in the cell block for more than 25 minutes at a time. Entering the cell block more than once every 24 hours. Any sound louder than ca. 25 dB. Personnel assigned to maintain the containment pattern are instructed to silently walk down the center of the main hallway at a slow but steady pace. As it takes approximately eleven minutes to walk to the execution chamber at maximum safe rate of travel, personnel will have only three minutes to work on the pattern and still have enough time to reasonably guarantee a safe exit from the facility. Auditory and visual hallucinations (including spectral voices, bleeding walls, and poltergeist activity) are considered normal. Lack of same is cause for concern. Personnel are encouraged not to investigate any dead bodies, supernatural activity, or rotting remains.